These sweet bouquets are perfect for welcoming a new bundle of joy. Let SUNNYSIDE FLORIST make this special flower delivery, along with your warm congratulations for family and new baby too! Call direct to send flowers for a new baby or order online 24/7. Pops of pink mini carnations and white cushion poms stand out from green button poms in this cheerful arrangement. Show your appreciation with fresh flowers that are sure to make them smile! 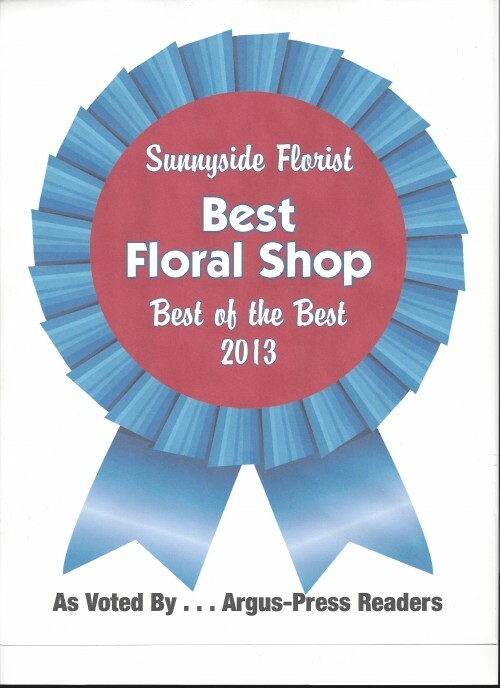 Call us at SUNNYSIDE FLORIST or order online flowers now. SUNNYSIDE FLORIST in Owosso, MI (MI) has great gift ideas on hand for any new mommy or baby. Help welcome an addition to the family with a beautiful floral arrangement or gifts. Beautiful flower centerpieces add to the decor of any baby shower, and every new mom needs a corsage for the event. Hoping for a unique shower gift? Customized new baby gift baskets are always a perfect way to let someone know that you care. SUNNYSIDE FLORIST will fill your new baby gift basket with, flowers, or stuffed animals that are sure to excite any new mommy. Top off your fun, unique new baby gift from SUNNYSIDE FLORIST with a balloon bouquet. Browse and purchase online from our selection of baby floral arrangements designed with a baby girl or baby boy in mind. Stop by our store or give us a call to place an order for something truly unique. Let SUNNYSIDE FLORIST in Owosso, MI (MI) take care of all your new baby gifts.